Written by Rob Dircks, Illustrated by Dave Dircks. Me and my brother Dave have teamed up again – this time with our very first children’s book! Alphabert! 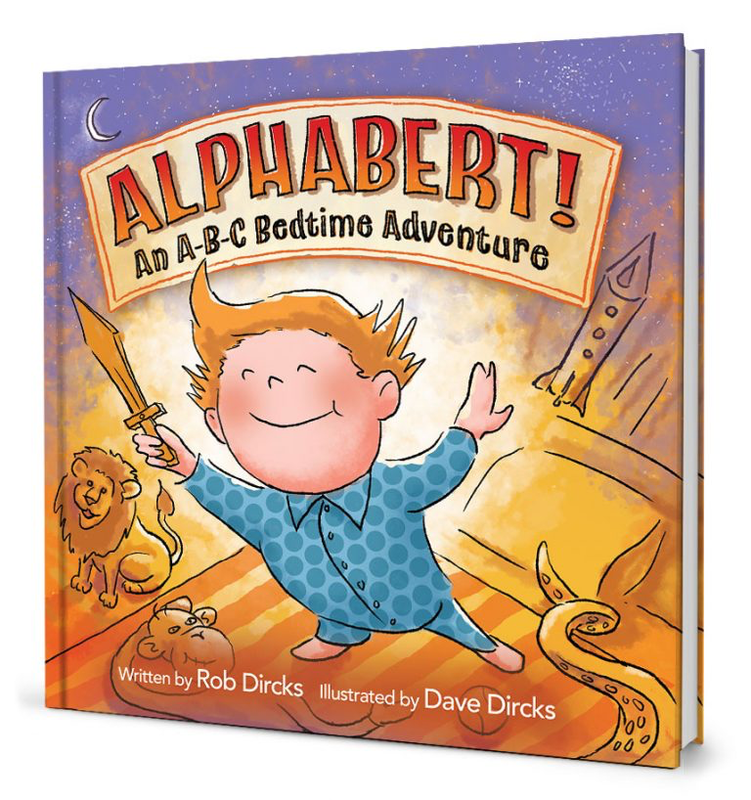 An A-B-C Bedtime Adventure is the story of Albert, a kid – like all kids – who just doesn’t want to go to bed. Using the alphabet and his vivid imagination, Albert embarks on various adventures, learning that nothing’s really better than a good night’s sleep. And you probably already know a bit about me, that I'm the author of the science fiction novels Where the Hell is Tesla? and The Wrong Unit, and a member of SFWA (Science Fiction & Fantasy Writers of America). And that I've co-owned Dircks Associates (an ad agency) with Dave for over twenty years. But how much do you know about Dave? Dave Dircks is an illustrator and creative entrepreneur (and member of SCBWI – The Society of Children’s Book Writers & Illustrators) whose work has been featured in books, magazines, album art, and advertising for over thirty years. In addition to commercial art, his paintings have been exhibited in New York City and his native Long Island. His first collaboration with Rob was a Super8 movie they shot in junior high school. Since then they’ve worked together to produce award-winning advertising, the number one acoustic podcast on iTunes,™ award-winning documentaries, as well as their latest venture – novelty and children’s books. Dave is a graduate of NY’s School of Visual Arts with a degree in Illustration. Prev:Introducing my new podcast, Listen to the Signal!